An luminescent Summer day calls for the Allman Brothers Band and today, inside and outside of the 'rock room' plays archival release number five from the bands official live release series. Featuring a smoking performance with the original band line up, this particular recording hails from the Summer of 1971 in Boston, MA and contains some unique and special music. 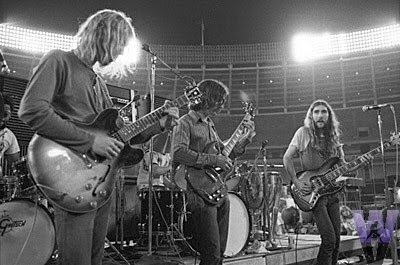 A bit over two months from this concert the band would never be the same losing guiding light, brother and leader Duane Allman. Fortunately recordings like this one exist and the glory days of the group can be revisited often. Fresh from recording the legendary 'Live At the Fillmore East' record, the band is primed, focused and hot for an eighty minute early show. Being an official release the sound quality is exceptional. Sure there are some moments of distortion, fluctuating levels or sonic gremlins, but all in all, this line recording features a balanced mix and clear vocals. The drummers Butch Trucks and Jaimoe stand out impressively on this recording and are an absolute pleasure to groove on with headphones, giving the percussionists a 3-D image. Most importantly the performance is imposing and the location, one of the band's favorite, notorious for powerhouse shows. According to the liner notes this is the first of two concerts performed at the Boston Common on that day. The concert opens expectedly with 'Statesboro Blues' a common opener for the era, Duane Allman's slide guitar sharp, slicing through the heavy Summer air relentlessly. Gregg Allman's vocals are youthful and gritty, a blues singer through and through.The band swings triumphantly and it is obvious this is going to be one of those nights. Betts takes the second guitar solo following Allman and strings along a series of celebratory and watery notes that drape seductively over the groove like a hippy sundress. The first three songs of the concert, 'Statesboro', 'Trouble No More' and 'Don't Keep Me Wondering' feature Duane Allman on snaky slide guitar taking center stage. 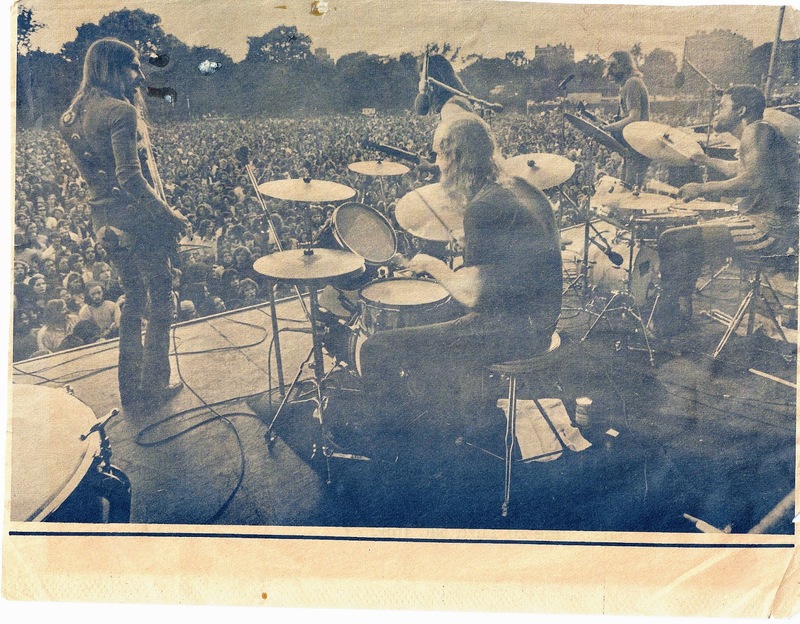 After 'Statesboro' I believe Duane Allman, encourages everyone to visit concessions to 'get loose' as the drummers pound out the introduction to 'Trouble No More'. Gregg and Duane play catch with the melody line, Duane echoing each line sung by his brother with rich sugary licks. Gregg digs his heels in for this number growling, the band coalescing, rising in temperature, reaching the boiling point. Berry Oakley and the drummers are in prodigious form this evening, 'Don't Keep Me Wondering' is a fine example of this, the rhythm section dynamically encouraging the groove, an avalanche of smooth rounded stones rolling down a steep mountain side. 'Dont Keep Me Wondering' reaches the first musical peak of the evening with Duane dramatically building steps to the musical summit. The band now warmed up, prepare to embark on the centerpiece of the performance. Allman (? ), in a chatty mood, during a brief break describes the bands love for Boston and how many of their most 'righteous' performances have taken place there before the band tip toes into the syncopated introduction of 'You Don't Love Me'. The next twenty six minutes are a clinic by the band, displaying a multitude of poly rhythms, virtuous guitar playing, and sweet Southern soul. Slow and slick out the back porch door, the band slinks through the introductory changes until 'Skydog' takes the first solo spot igniting the tempo of the band and proliferating the intensity. Betts takes the second solo spot, hanging onto each note for dear life, stretching and ringing the emotion out of every note, like squeezing the juice out of a luscious fruit. Like a country gentleman sipping sweet whiskey in the yard, Betts takes his time, elongating each and every note, drawing deep. Duane takes another driving turn, before the band drops out at six minutes leaving the stage to Allman alone. Duane, in a slightly overdriven tone, honks and tonks his way through a series of sensual melodic statements. 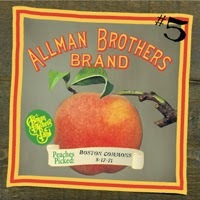 Finally settling on a sweet hummingbird tone, Allman gently tickles some of the most nectarous licks you will ever hear. At almost eight minutes Allman gets a bit more distorted, his tone more aggressive and the solo morphs into a guttural blues display with squiggly wiggly shaded exclamations. Allman finds a central spot, dances around that spot with a series of related statements, then fires off a series of disorientating swells and neck slides at around nine minutes. The drummers add random punctuations before a Tympani signals the 'boogie' segment of the song, at nine and a half minutes the drummers and Duane head to the backcountry for awe inspiring views and rare and airy melodies. 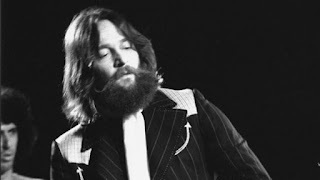 At a bit past eleven minutes Allman is now acting as someone who channels, a plethora of vibrato and sustained notes escape from his guitar in a flurry like cottonwood on a comfortable breeze. The drummers circle one another in a battle stance, the jam hits a plateau where it carries a consistent blast of energy in a straight line peak. The dynamic intensity of the improvisation drops again, this time Allman is disseminating notes in a endless series of exclamations. A joyous Georgia swamp ballad manifests from his fingers, these moments the reason why, even in his short time on this earth, Allman is considered one of the finest string benders of all time. A shuffle coagulates from thin air, Oakley and the drummers lock in the rhythm and Betts and Allman stand back to back preparing for the dual. Gregg lays cornerstones with a hollow Hammond base over which Betts and Duane run side by side down dusty country roads, coming close to touching bumpers before splitting off away from one another. Betts the able younger brother stays close to Allman, repeating licks back to Duane similar to an annoying sibling. Both guitarists drive the other deeper, faster and farther before they converge at eighteen and a half minutes to hit the quintessential dual lined Allman Brothers guitar groove. After nineteen minutes the band drops out again leaving Duane Allman to explore the musical horizon, scanning for the perfect location in which to embark. The group eventually coalesces into an inspiring sunrise explosion that only they as a group could conjure. The music swells organically, each member encouraging the creation, no one in particular directing the flow, just letting the music find its way, sonic water seeking through the cracks, making a path. 'Joy To the World' makes a brief appearance before the song reaches an immense conclusion that defies proper classification. Less a musical creation and more a natural occurrence of developed sound. Possibly only placing second to the jaw dropping performance on August 26, 1971, that expanded on many of the themes developed here, and the similarly powerful September 16, 1971 this version of 'You Don't Love Me' is worthy of inspection and archival remembrance. The band then aggressively busts down the door with a crooked 'Hoochie Coochie Man', Oakley fittingly getting his spotlight moment for the evening and making the most of it. The band's arrangement of this song is always a show stopper for me and this performance is no different. Weighty tumbling drums and an earnest vocal reading by Oakley are highlights of the performance. Betts plays a fine solo during the song in which Oakley follows with busy fretwork. A sizzling version of 'In Memory of Elizabeth Reed' comes next, during which come points where I have to stop and stare at the stereo system due to the sonic assault that is pouring from the speakers. The Dickey Betts number has become one of the most enduring tunes of the Allman's catalog with performances occurring right up to today. This particular version in my opinion sits in the era where the song reached its optimal power and strength. The band navigates the changes with grace, with the song increasing in intensity as it continues. Betts first solo is a tranquil exploration of the theme, languid and inquisitive. Betts pulls against the forward propulsion of the band, with ringing elastic notes. The jam reaches a reverberating peak with Betts quickly climbing a ladder and Oakley rising from the froth with superior statements. Gregg Allman takes the second solo, the jam turns funky with both guitarists alternating rhythmic statements. Duane takes the third round, entering with a tangled weave of notes that become solitary blocked statements. Oakley takes the lead under Duane's thick notes, until Allman suddenly unleashes a torrent of teeth grinding licks, climaxing in his usual guitar wizardry. The band tightly and euphorically stomps out of drum interlude and through the finally. With time for only one more number as heard from Gregg Allman speaking from the stage, the band closes with 'Whipping Post'. This eighteen plus minute version contains all of the twists and turns and dramatics that one can hope for. Similarly to the entire performance, this version also rockets at high velocity with the drummers a throwing out a heterogeneous mixture of rhythmic delights. Duane Allman enters the first solo quickly with some cosmic conjuring. This is not a solo that builds in intensity, this is a solo that cruises consistently at a towering altitude, each lick bettering the previous. Duane, 'hitting the note' and acting as a Tesla tower that receives and then disseminates mystical melodies. The tension is key, the music pulsing like a amoeba liquid light show, not a wasted phrase or note, each moment contributing to the whole. Betts takes the solo after the second verse and leads the band through a dark and haunted valley before coming out the other side with a series of scarring extended statements. This is Betts finest guitar work of the evening and is inspiring in its construction. There is some static on the recording at this point and what sounds to be a change in the source recording. The band blasts out of the drift and through the guitar peak of the track before dismissing gravity and settling into a floating musical wash. The three guitarist twirl around one another in a tripped out woodland dance. Oakley drones, the drums swell in a cymbal rain. Allman and Betts join together in a delicate descending etude that falls into the extended conclusion of the song. 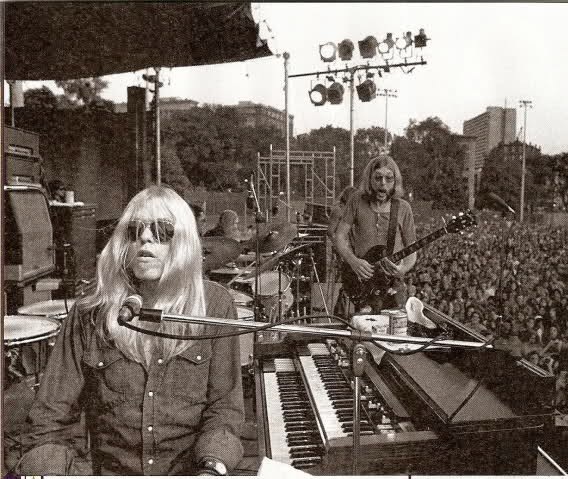 Gregg Allman rejoins ruminating soulfully, leading the band through the climactic ending of the number, thus ending the show to great applause and enthusiasm. This particular era of the Allman Brothers Band that features the original founding members is truly going 'Back Where It All Begins' and investigating the formative roots of their forty five year career. 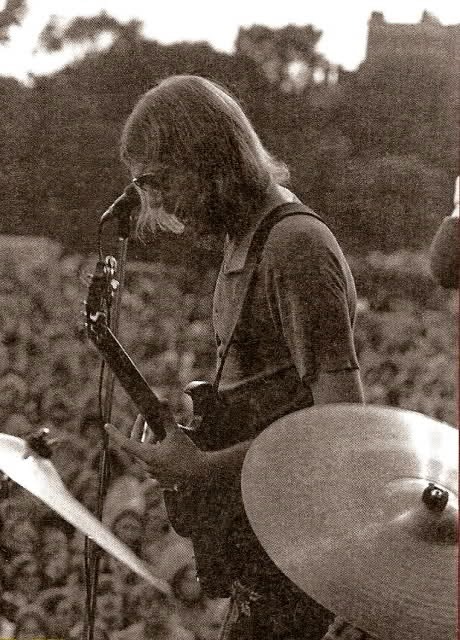 While the Allman's available official recordings of this time contain many of the same songs; like nimble jazz musicians, the Brothers take each performance and turn it into a unique piece containing elements and characteristic that no other show has. This particular recording captures the band reaching their first full musical peak and also their first natural conclusion of an era. Soon their popularity would reach full fruition, unfortunately the heart (Duane) and soul (Berry) of the band would not be there to witness it. Go out and grab this archival release when the band was still discovering the magic they were able to conjure on a nightly basis, and were arguably the best band in the land. Highest compliment I can give is i went out and got this after reading!
" Just get here .. " .. me being in New York I hopped in my 1950 HUDSON 'n headed North. Never'd heard Slide Guitar as a featured instrument - I got staring at Duane's technique - totally lost presence , he noticed 'n turned the guitar towards me for a brief Master Class .. . . the Second Photo above I believe captured the moment . Came away a very different Guitarist .